you can thread a sewing machine while it's running"
I had a "brewed" awakening one morning when I found a package of coffee filters that I don't use anymore. What to do? What to make? 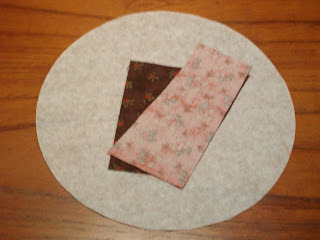 I couldn't just throw them away...how about sewing with them! I am so flying by the seat of my pants on this Tool Time Tuesday. 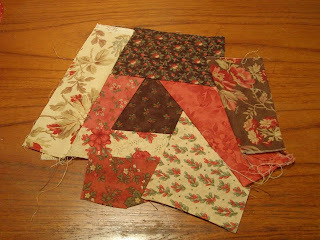 I have never made a crazy quilt block or used any type of foundation when quilting, so if there is anything that looks like I need help...please let me know. 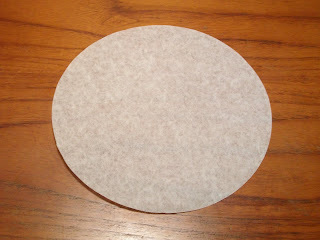 One paper coffee filter ironed very flat. randomly place a piece on the filter right side up. 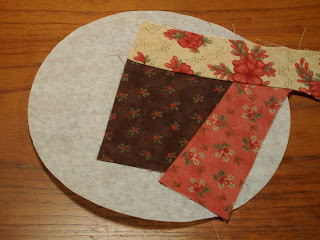 Take another fabric scrap and place it on top of the first piece, right sides together. 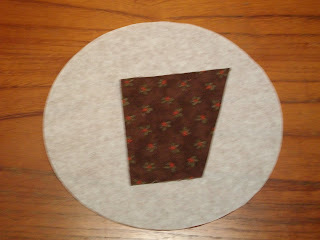 Stitch with 1/4" seam, sewing through the 2 pieces of fabric and the coffee filter. Here is a close up of the seam. 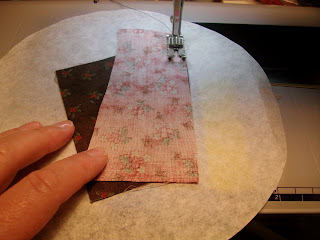 Open up the top fabric and press with hot iron. Here it is pressed open. Select another piece of fabric and place right side down on the 2 first pieces. Play with the placement, so they aren't going all in the same direction. Sew again with 1/4" seam. 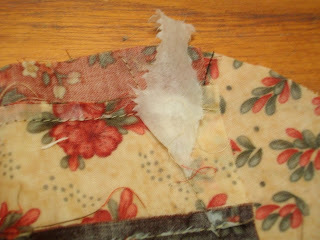 In this close up, you can trim the extra fabric that sticks out beyond the 1/4" seam to reduce the bulk. Iron the new piece open. 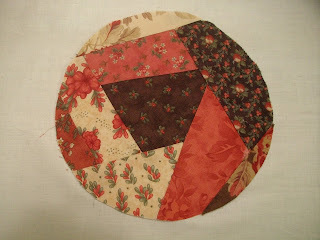 In this picture you can see that it doesn't matter that the scraps extend beyond the shape of the circle. 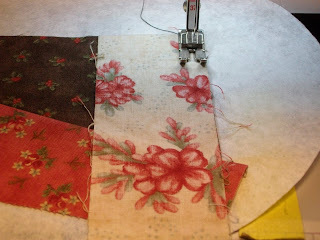 Keep adding scraps right side down on the last sewn fabric. Press each piece open after sewing it down. When you have completely covered the coffee filter, it will look like this. (I know...it looks like a mess, but you'll see). 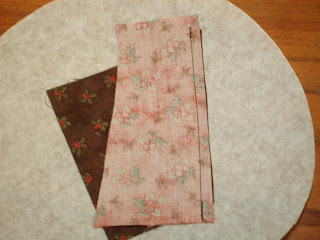 Trim the excess fabric up to the coffee filter. Dampen the coffee filter with a spray bottle of water or just soak it in the sink like I did (flying by the seat of my pants...not knowing what I was doing here, but it worked!!) This helps the filter just melt away from the seams. Tears off very easily. Press again with the iron and there you have it...a perfect "Crazy Coffee Circle". 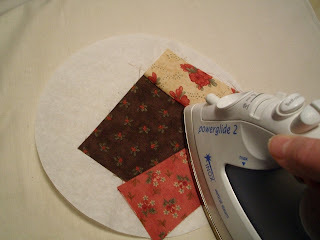 All you need to do is applique it to a pillow, make several more and blanket stitch them to squares of fabric and make a quilt with all these scrappy circles. You can also cut a square out of it if you wanted to. The size of my filter when it's ironed flat is 8 inches across. I started this project after work on Monday night, another late night project as usual. I had no plan of action...just grabbed some fabric and sewed away. I think I'll pick out more fabric and make a bunch of these. Can't wait to see what a full quilt of circles sewn to different squares looks like. These were very easy to make, so I hope you can join me in making these fun circles. I looked up the definition of a "Coffee Klatch". It is a casual social gathering for coffee and conversation. spaceMaybe I should start a virtual "Crazy Coffee Klatch". 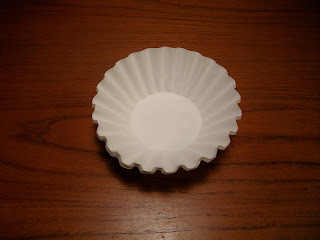 We could all make our own version of the coffee filter circles, while having a nice cup of coffee and then post it on our blogs. Let me know what you think...sounds crazy, but that seems to be the theme of this post. I think I need to go to bed now!!! Awesome idea! Great way to use my scraps. 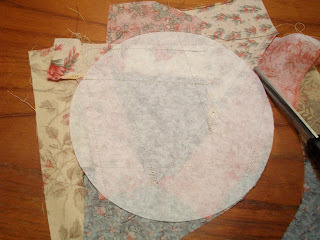 Those crazy quilt circles look like they would make great pot holders. You should put all these ideas in a book. Great idea! Love the crazy circles. I'll add it to my list. How clever is that and I just happen to have some filters that don't fit my coffeemaker....sure glad I visited you today now I know what I'm going to do with them I also think you should write a book! Well how cool is that! 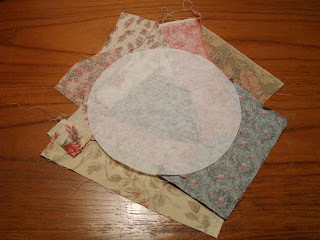 I never thought of circular crazy quilt squares... ummm, I mean circles. I'd love to see what you do with them! I really love this idea. I think I have some filters in the pantry, and we don't even drink coffee! Am definitely going to try this. Great job....as usual! I'm not a coffee drinker but I'm going out to get some filters. This sounds so fun! OUTSTANDING!!! I am so going to try that!!! I am drinking my coffee right now, really all day!! What a great idea! Those coffee filters are good for so many things! But I never ever would have thought about this one! Love the coffee quote too...my grandmother drinks so much coffee she probably could thread her machine while it's running! You are something else! I don't know how much longer you can continue to provide some new, clever idea each Tuesday, but I'll be enjoying them as long as you can do it. Love this project! The scrappy circles are great! 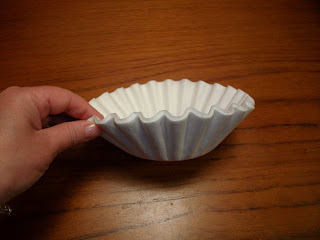 This is a great idea and one I am going to try tomorrow (I have lots of coffee filters I no longer use). I love the idea of the Crazy Coffee Klatch! I drink about 2 pots of coffee each day. I have lots of filters, so count me in! Karen...the crazy circles are great! Thank you so much for coming up with this fun idea! You are flying by the seat of your pants with "flying colors"! For not having a plan, I think you have done really well! LOL. Really, this is great, for those of us who don't do circles, you have just made it super easy!!! Thank-you! I too, Love your idea. 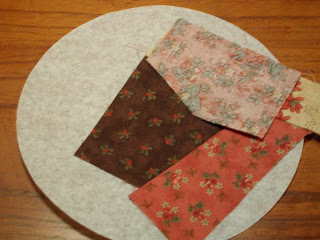 I have already put coffee filters on my grocery list so I can make a quilt of scrappy circles. Thanks for the great idea! I saw these and immediately thought of cup coasters. That is so cool. 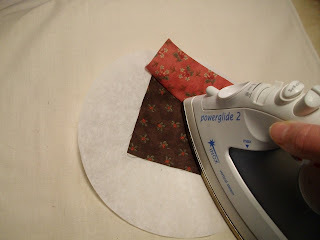 That circle would make a great big pincushion or a quilted trivet for a hot casserole dish or a big coaster...what a cool idea for a coffee filter!!! And this is useful! You crazy girl! Love the whole concept of it, and I don't even drink coffee, but I do know that the filters are CHEAP, grin. Going to have to try this with some of my scraps, might even put an embroidered piece in the center to really spark it up. Oh my gosh, Karen, this is too great!! I can't wait to try this! I wish my brain worked like yours does that late at night!!! :) Thanks for sharing. Karen this is a cool idea, I'm looking forward to seeing what your end product will be. Coffee filters are also good to catch threads with, I have one hanging on my short arm frae machne. It has given me a place to throw my threads after trimming and keeps my frame cleaner. You're so clever Karen! I'm so impressed by this tutorial. I've always been intimidated by circles. You made it seem fun and easy. Thanks! Karen, wow! That is so cool. I just came home from a Bonnie Hunter workshop and this looks like it would be right up her alley. Great way to use up those scraps! Oh how awesome. These would be great appliqued on white fabric. Awesome! 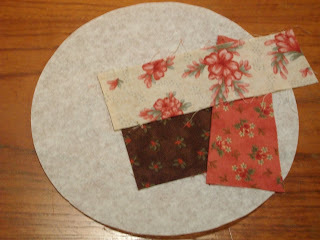 Add some lace and a circle of felt for a vase cloth! I think you left the door open on this one Karen. Great idea starting with the coffee filters. Ooohhhhhh I love you idea of a coffee klatch! and the circles would be great for a quilt. How neat is that! What talent and imagination! I am going to have to keep this in mind Thanks. I love this for circles as well! Thanks Karen. So here is a little math for those who want a square in a circle or a triangle in a circle. For the square in a circle, remember the diagonal of the square would be the same as the diameter of the circle; so for an 8" circle the sides would be 5.65", & 8" diagonal. For a an equilateral triangle (all sides equal)in an 8" diameter circle ~ 6.93" per side of triangle...easiest to just follow this link & print out the shape on your printer. Ooooo! Imagine using the smaller and the larger coffee filters for another option! This is so cool. ty for sharing. I'm thinking this would be a cool way to make an interesting scrappy Yo-Yo quilt/pillow/coverlet/etc - you'd just need to be sure to have a single fabric at the very center of the filter. Ideas...ideas...ideas! I just might have to try this out... Thank you for the inspiration! This is such a wonderful idea you shared with us. Bless you. 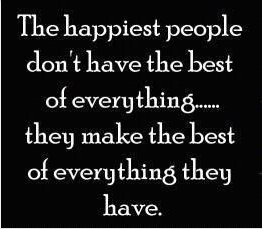 yes, with good friends and a nice cup of coffee. Luv your tutorials, daughter in law lives out of state (hubbies in air force)she is learning to sew and this is a awesome way for her to learn to do small quilts at a time. Love the idea! thanks for sharing. saludos from Costa Rica! I saw where someone mentioned pot holders, These would also make great hot pads. Absolutely Gorgeous! The circles would look wonderful on a square quilt, as suggested. Great idea and thanks for sharing your talent. I think this is a great idea for cathedral windows. the circles would be a consistent size. Thanks for the tip. I have pressed these and used them with my embroidery machine for years...just slide them under the fabric after you have hooped it and attached to the machine, hope you find this helpful. 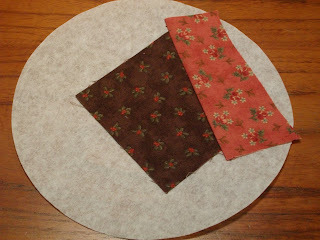 I love this idea for potholders or mug rugs. 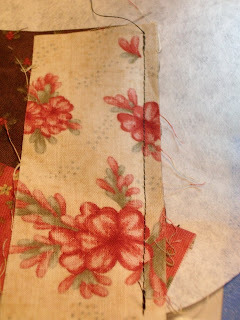 I might even go over each seam with some of the fancy stitches provided on my machine and then use different color threads like a crazy quilt. Finally, I'd have a use for those stitches. I will have to pick up some filters when I'm at Costco--that'll be a lot of potholders! Thanks for an inspired idea. You're a genius!! Such a great idea. I will have to try it! !